Join the Army and See the Universe. That is the motto of The Third Space War, also known as The First Interstellar War, but most commonly as The Bug War. 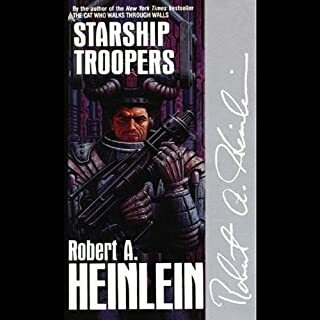 In one of Robert Heinlein's most controversial best sellers, a recruit of the future goes through the toughest boot camp in the universe - and into battle with the Terrain Mobile Infantry against mankind's most alarming enemy. Recording was mostly good, except for occasional sentences or paragraphs that were overdubbed and sounded awful - muffled, and possibly even a different narrator.